SEOUL, Dec. 18, 2014 ― At the 2015 International CES® from Jan. 6-9 in Las Vegas, LG Electronics (LG) will be unveiling an impressive TV lineup featuring the company’s newest webOS 2.0 Smart TV platform. LG’s webOS 2.0 is specifically designed to enhance the key features found in the current generation of Smart TVs, resulting in an outstanding user experience unmatched by any competing system. What’s more, LG is working with content providers such as Amazon and Netflix to ensure that LG TV owners are guaranteed a wide range of viewing options in brilliant 4K resolution. Initially designed to “Make TV Simple Again”, webOS TV was originally developed to address the growing frustration with overly complex smart TVs. With a focus on three overarching features ― Simple Connection, Simple Switching and Simple Discovery ― webOS made navigating today’s state-of-the-art TV systems easier than ever. 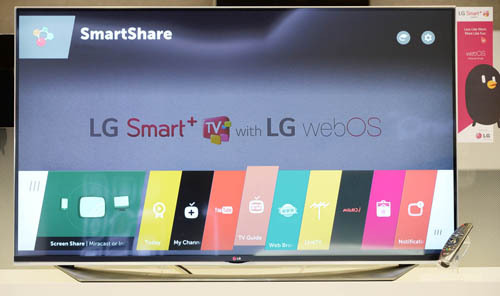 Consumers embraced LG’s efforts with webOS Smart TVs topping 1 million mark in unit sales in the first two months after its introduction earlier this year and recording more than 5 million unit sales within eight months. LG’s webOS 2.0 takes simplicity and convenience to a whole new level even while managing more content options than ever before. webOS 2.0 offers a long list of improvements and impressive features. Boot time has been reduced by up to 60 percent and accessing content has been made significantly smoother and faster. When switching from the Smart TV Home Screen to YouTube, for example, users will see an improvement in loading time of up to 70 percent. Also new to webOS 2.0 is My Channels, which allows users to customize their favorite live TV channels or set-top box channels on the Launcher Bar for greater convenience. Quick Settings lets viewers adjust their TV without interrupting the program they’re watching and Input Picker allows connected devices to be recognized instantly for immediate use. Through partnerships with major content providers, webOS TV owners can access a huge selection of Ultra HD content via services such as Amazon and Netflix. LG webOS-enabled Smart TVs have access to 4K resolution content on Netflix, including highly-rated programs such as House of Cards and Marco Polo in 2015. Ultra HD content on Amazon includes movies such as After Earth, Elysium, The Amazing Spider Man 2 and The Da Vinci Code. Visitors to LG’s CES booth at the Las Vegas Convention Center (Central Hall #8204) will be able to experience the full range of new webOS 2.0 TV products.